Janathon Day 23 Can you take me seriously? Rupert considers his next move. 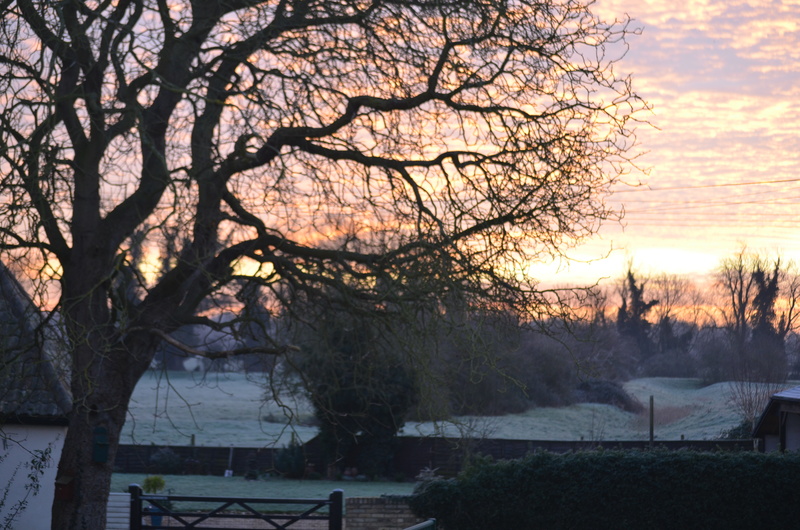 Actually this pic was taken last year, or even the year before, when it was particularly frosty. He struck a similar pose this morning but there was no frost and I didn’t think it worthy of a picture. 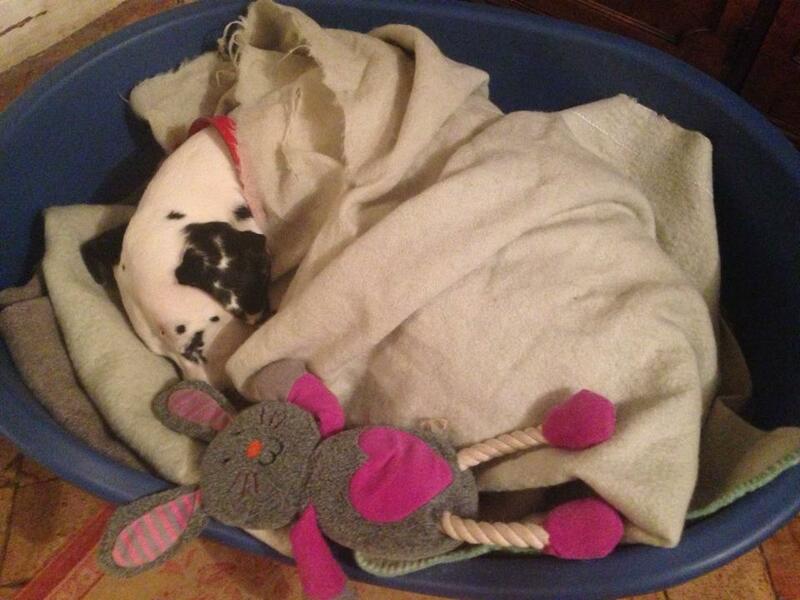 He’s still sulking. I’m thinking of making an appointment with the vet. Is narcissism in a dog treatable? Cambridge parkrun this morning. Muddy and mild. I’ve done the last four Cambridge parkruns within four seconds of each other and two of them in identical times. I’ve noticed similar patterns before. I don’t look at my watch during the run and always run as fast as I can. Conclusion? Week to week I am very consistent or rather I have periods of consistency. At the present time I am consistently running two minutes slower than in October last year, just before I fell in a half marathon and injured my thigh. Injury is all cleared up and I feel I am flying. Conclusion? The nature of time has changed. It’s obviously speeded up! Still, I enjoyed the run and had a nice cup of coffee with Eric and Kerry. The women were surprisingly absent so we were able to endlessly discuss football, darts, fast cars, technology and do a bit of online gambling on our smart phones. We also took turns to read off our running stats from Strava, Garmins and Fitbitty things. And then we went to the pub and sank a number of pints. No, I’m making this up. I just had coffee with Eric and Kerry and we chatted about running stuff. An enjoyable morning. Rupert is unimpressed by the scary “shadow man” manifestation which appears fleetingly then disappears. That’s the nature of shadows, man! He is the “Gate Keeper.” If “shadow man” is present, you may pass through the “gate,” to gain entrance to the next field, or rather “field”. 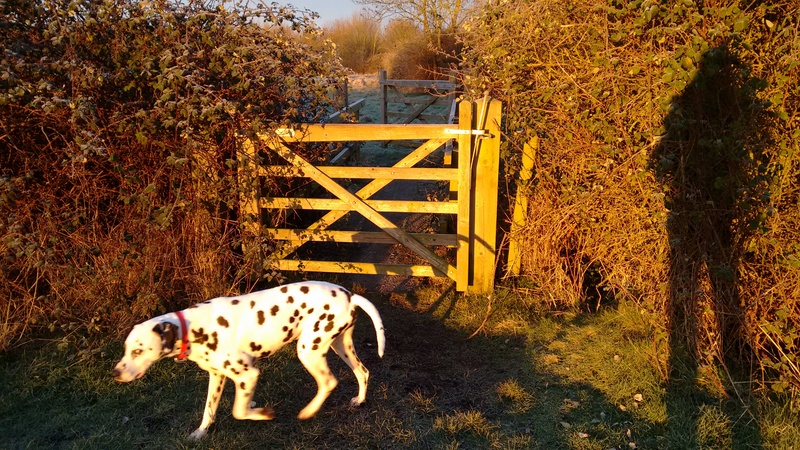 If you don’t see him, DO NOT PASS THROUGH THE GATE. Rather worrisome, innit! But not as worrisome as Sarah Palin and Donald Trump on the same platform. After my 10 mile run yesterday, I felt rather good ie tired but relaxed and appreciative of an evening rest. I felt an impulse to have another long run today and had to resist it. I ran a couple of miles only just before dusk. It snowed yesterday evening, not for very long, but enough to give a covering which lasted until today. 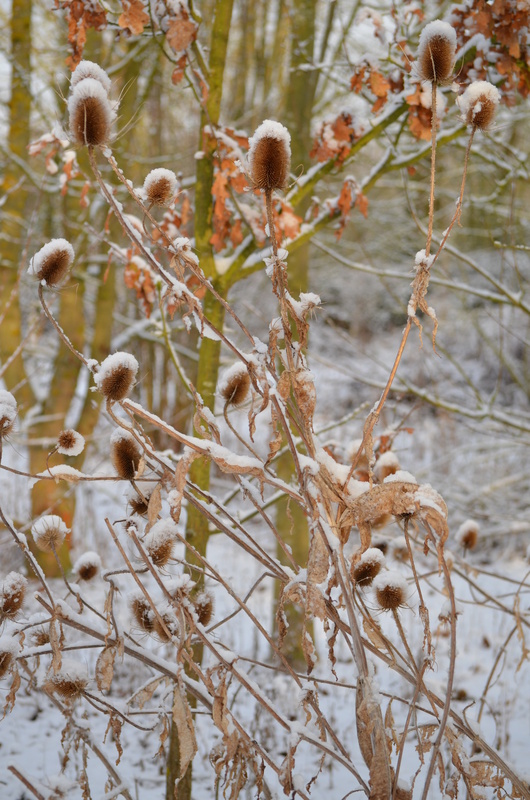 These teasels were very happy with their little white hats. They tittered as I passed by with Rupert the dalmatian. 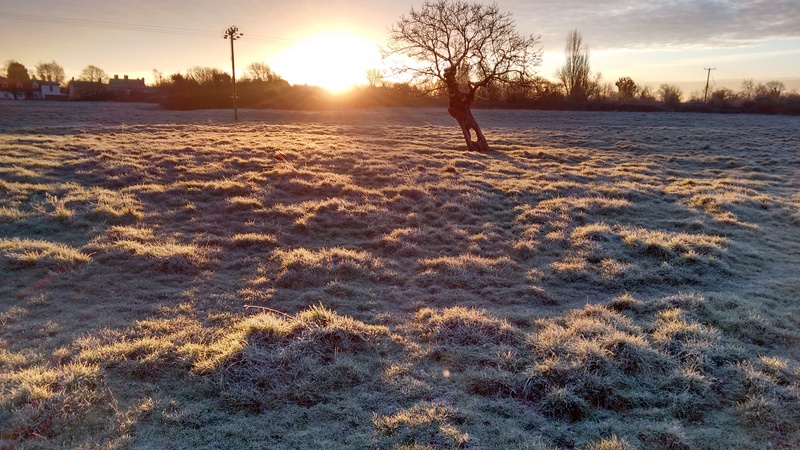 It was a beautiful, snowy, sunlit morning but as a result of the snow and the continuing low temperatures, the club, which meets at the Cambridge University athletics track, cancelled tonight’s track and road sessions. I haven’t run since the end of Janathon so, as there was no club run, I went for a 2 mile jaunt locally. I’m now ready to return to fitness following my uncool fall in front of the club elite (after I failed to see a curb that no-one had stumbled over for the last two centuries). The big bruise on my bottom is fading and my pride is undergoing active restoration. I’ll get used to my nickname Trippy. Cambridge half marathon is coming up on March 8th and long runs need to be run soon. I’ll try an hour or 75 minutes tomorrow, some of it along the river Cam, and see how it goes. 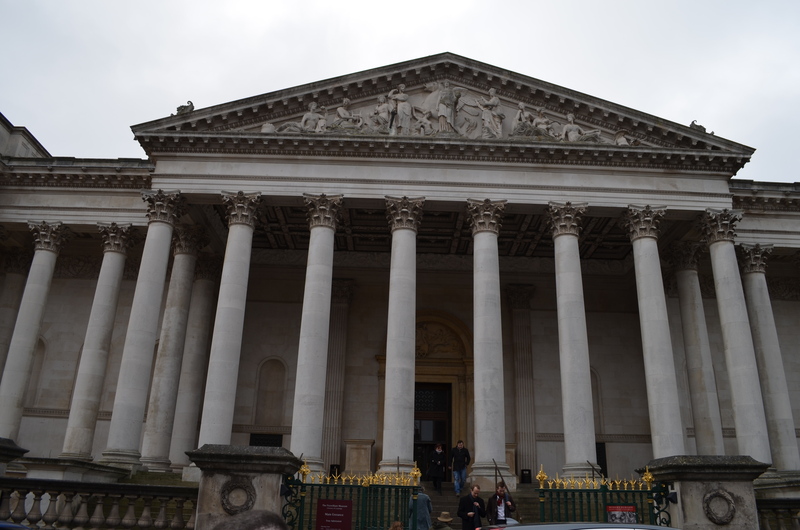 I sauntered into Cambridge city centre on Sunday, primarily to visit the Fitzwilliam Museum and to take some pictures. 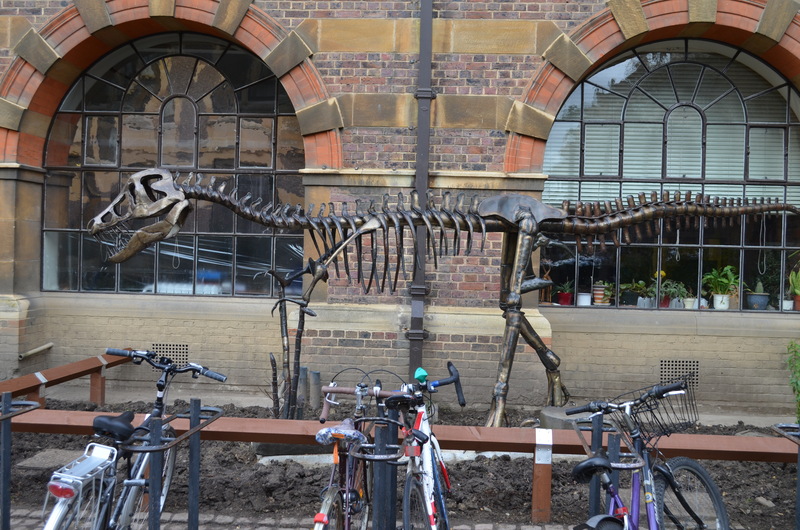 This dinosaur skeleton sculpture is a recent outside addition to the Sedgwick Museum of Earth Sciences. 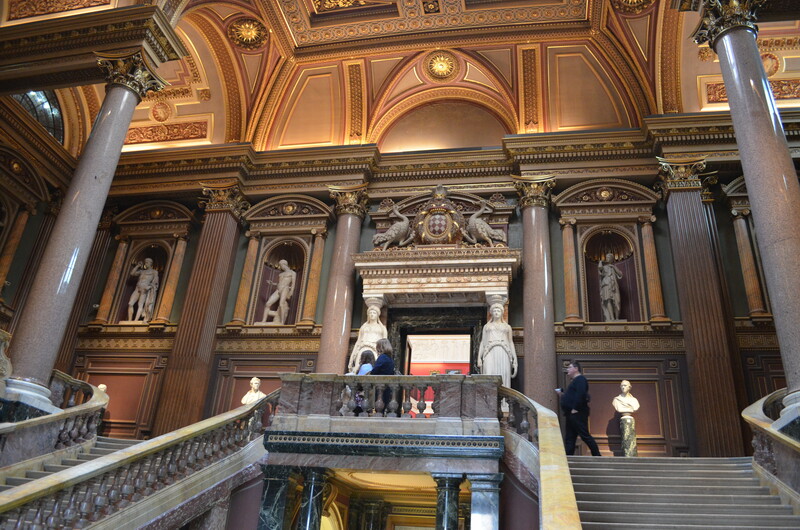 The Fitzwilliam Museum. Only a partial image of a wonderful building. Too much traffic passing. The lower picture looks out from one of the flanking lions at one end of the museum. 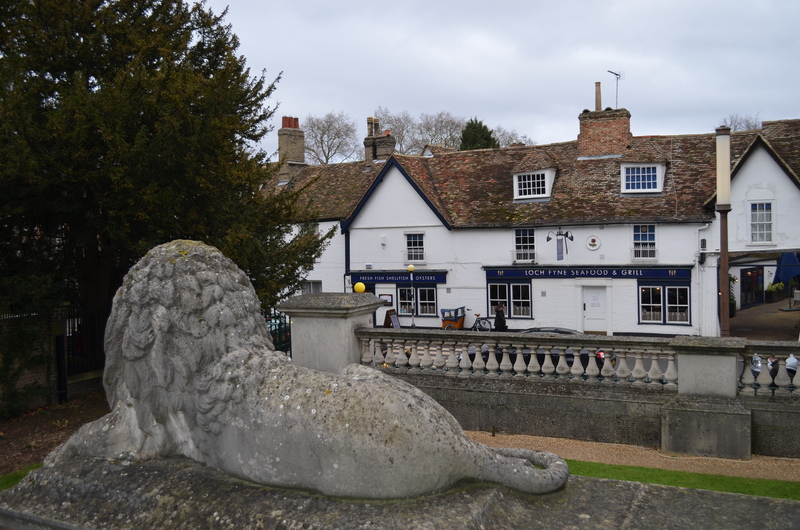 My latest wheeze is to start a photographic blog of Cambridge and its environs. It’s a privilege to walk around old Cambridge and there’s always new aspects to record. An occasional photographic blog will find a home for these images.